The best caffeine-free weight loss pills for both men and women. Phoenix contains no caffeine or other overpowering stimulants, which makes it the ideal diet pill for both women and men. It also means you can keep drinking your coffee and pre-workout supplements without worrying about having too much caffeine! A healthy way to boost your metabolism and lose weight faster. Research shows that several of the thermogenic ingredients in Phoenix can significantly increase your basal metabolic rate. Imagine burning upward of 200 to 250 additional calories per day without having to sweat for it! Helps you control your appetite by reducing cravings. This isn't a harsh appetite suppressant. It's a diet supplement that contains 5-HTP, which helps you beat your hankerings for the foods you know you shouldn't be eating. And as we know, the better we can stick to our diets, the better our results will be!Natural & safe fat burner that works without side effects. 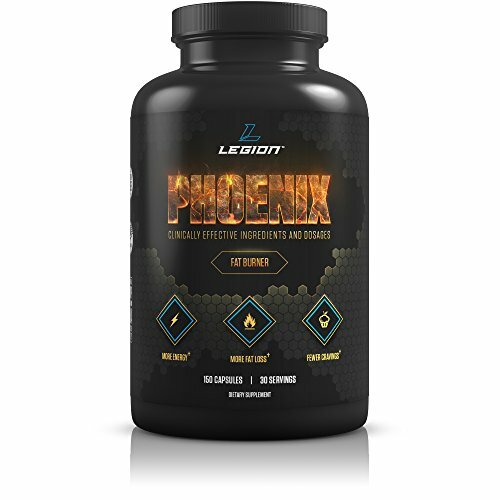 Phoenix contains safe, natural ingredients proven to accelerate fat burning like green tea extract (EGCG), synephrine, and forskolin. Lose weight faster without pumping yourself full of stimulants or other potentially harmful chemicals and without the jitters, anxiety, nausea, or stomach aches caused by other weight loss supplements! Buy the best fat burner with confidence. Give Phoenix a shot and if you're not satisfied for any reason, simply contact us within 90 days of the purchase date and we'll issue you a prompt refund. LOSE WEIGHT & "STUBBORN" FAT FASTER - This 100% natural fat burner speeds up your metabolism and amplifies the power of your body's fat-burning chemicals so you burn more calories and lose more fat. It also helps you lose the "stubborn" fat in the belly, hip, and thigh regions faster by making these fat stores easier to mobilize and burn! ENJOY LESS HUNGER & CRAVINGS - A major reason diets fail is people just aren't able to stick to them long enough to see results. This is why studies show dietary compliance is the #1 predictor of long-term diet success. PHOENIX increases the feeling of fullness you get from food and reduces your cravings for carbs in particular, which makes it easier to follow your diet plan and get the body you really want. CLEAN INGREDIENTS BACKED BY SCIENCE - Legion Athletics never compromises on quality, and all our products contain 100% transparent formulations with no "proprietary blends." That means you know exactly what you're buying, and every ingredient and dosage in this product is validated by scientific studies, including synephrine, forskolin, green tea extract, and 5-HTP. THE MAN BEHIND THE BRAND - Mike Mathews is an international bestselling fitness author with over a million books sold, and the co-founder of Muscle for Life and Legion Athletics. In his own words, "I founded Legion to bring something new and unique to the supplement world, because let's face it, the last thing we need is yet another line of flashy, hyped-up, bogus pills and powders."